Lewis Skene, 26, is one of the Friend of the Neuro Wards’ long-time supporters. The charity raises money for vital equipment at the neurological wards at Aberdeen Royal Infirmary and Woodend Hospital, while also raising awareness of the impact of such injuries and disorders. 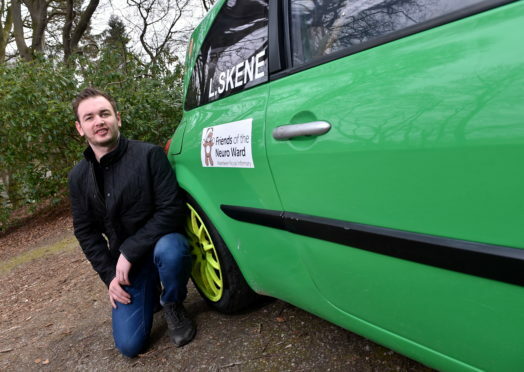 Mr Skene, who runs his own car detailing company, regularly takes his bright green car to competitions such as the Royal Deeside Speedfest and the Superlap Scotland tournament – with plans to attend even more races this season. He is in the process of de-stickering the prize motor, and is now offering each panel up for businesses keen to advertise, with the proceeds going to FOTNW. Mr Skene said: “One of my good friends Carolyn Toshney, whose husband had a brain tumour, is involved with Friends of the Neuro Wards, so that’s how I got to know the charity. “I also have a few friends who are surgeons in ARI and they saw how much FOTNW have helped with buying equipment and other things.